This week we've got a special video in place of the weekly product demonstration video, check it out. This week we have a smaller than usual list of new products, so I decided to do something a bit different. I was wanting to talk about a product that we carry that's never gotten a proper introduction, but it didn't seem fair to pick just one. So, for the next couple of weeks, I present to you, Shieldstravaganza. We're going to be briefly talking about all the Arduino shields we carry. Adding them all up, we have about 50 different shields and it was fun to put them all on a table and talk about why each one exists. Of course this video isn't meant as an in-depth demonstration of each one, but more as a 'hey, what does this one do?' This video (and the ones to follow) really tested my knowledge of our product catalog. I admit, there were a couple shields that I didn't immediately recognize and had to research before the video. It's pretty interesting to see the whole range of shields at once. That being said, let's see what new stuff we have for this week! 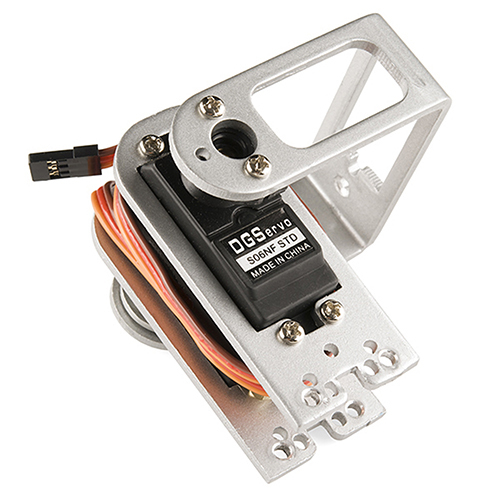 Since we have a new MKII version of our robotic claw, we now have a MKII for the matching pan-tilt bracket. The new bracket has a couple additional holes that line up with the MKII claw. The older bracket can still work with the newer claw, but will require a bit of modification. The pan-tilt bracket should work with both claws as it has both hole patterns. Remember those coin acceptors we got a couple weeks back? Well, they've already discontinued the 2-coin acceptor. Boo! 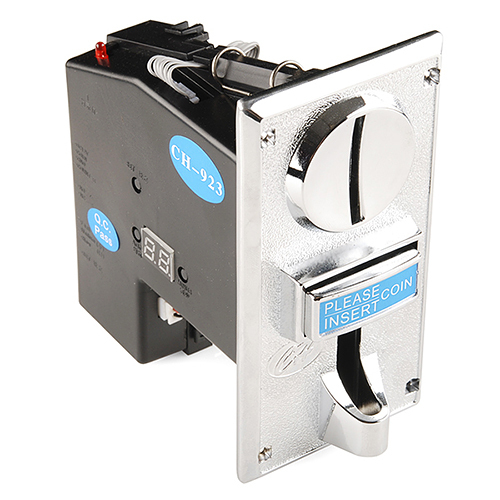 Thankfully, we have a 3-coin acceptor that's even better! This one will of course recognize three different coin types and even has a nice little display on the inside to indicate which coin it just recognized. And lastly, we have a new version of the 4D Systems 3.2" LCD screen. The new version has some minor hardware and software updates. 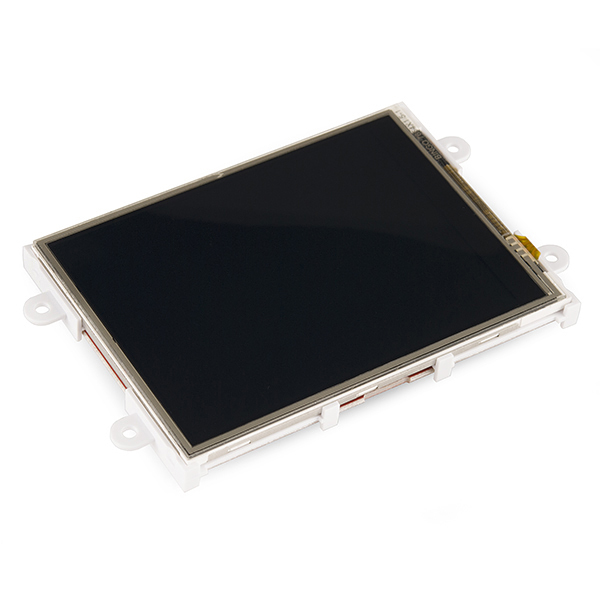 This is a 240x320 LCD screen that would be great for a slick GUI or even 3D graphics. Well, that's it for this week. Be sure to check back next week, we actually have a VERY interesting new product to talk about that should shake things up a bit. See you then and thanks for reading! I want them all! Make a huge bundle! (No don't do that. My Wife will give me the evil eye for as long as we are eating ramen to pay for it, especially since she can't eat ramen). Videographer here. Funny you should mention this! I sent out an email a few weeks ago saying this exact same thing and nearly everyone in the company accosted me. In fact, Rob and Dave were the two most against it. Its their fault we don't have any fun. I dunno man. Apparently there are issues of cultural appropriation to consider. Sparkfun must be the coolest company I know but if I saw you guys dancing like that, for this meme, I would defiantly lose some respect for you guys. In all seriousness, I expect if I'd grown up in Harlem and knew what the actual Harlem Shake was, and then a bunch of people started doing some other random unrelated thing on the internet, I'd probably be irritated too. On a somewhat related note, it turns out that there's an entire universe of incredibly detailed dance-related instructional videos on YouTube. I'd somehow missed this. I work for a company like this as well. No fun having hippies who believe everything should be free and great. Except if you want to...have fun. Great review of the shields, but a little slower would have been nice, it was kind of a bit quick to absorb it all. Also, will somebody please buy Rob a razor? I think he is getting ready to return to the family business making duck calls! first, we were going to go slower, but it's difficult to really go into much detail without taking a minute or so per board, which would be a REALLY long series of videos. it's just a brief overview, so if a keyword sounds like something you're interested in, you can check out the product more on it's product page. And yes, I have a beard, come to terms with this. Add a swear jar for the words "nice" and "great" ! We do have a Jargon Jar here. The real question is whether or not Rob has successfully elevated the words nice and great to the level of "jargon"
With 50 shields, and each one is either nice or great, I think he will manage to take those words to the next level ! You got me. That page was showing it as retired when I first commented. Maybe you were looking at an older retired version? So, just for fun, what do all the shields look like stacked one on-top of the other. Regardless, I enjoyed this video very much. Great shield summary there. I'd love to see just a very quick demo of each one, even if it's a short clip from a previous video or shows some example code running. we thought about that. since we spend about a week on each project we do, the video would take almost a year. When will the Sparkfun Deflector Shield be back in stock? it's a new word. I kinda like it. I'm gonna coint it as my own. You've got a trailing 0 on your 3-coin acceptor link.